Shelf Utd v Hebden Royd Red Star. Danny Thornton. 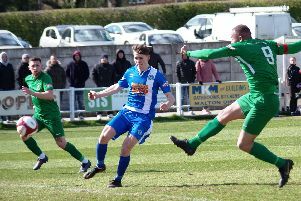 Shelf United produced the perfect response to their embarrassing derby defeat at Northowram with a richly-deserved 4-1 win away to Halifax AFL champions Calder ‘76. The match had ‘home win’ written all over it with Calder up to third in the Premier after a fine run and Shelf next to bottom following a 7-0 defeat at Northowram Rec. However, the visitors got their act together in fine style with returning pair Danny Thornton and James Goodwin playing starring roles. Thornton was one of the visitors’ scorers with Ben Grech, Dan Stoker and Hayden Finch getting the others. At the other end Goodwin deflected a Remi Allen effort onto a post and Calder had appeals for a penalty for handball turned down. Calder got back in it shortly after half time when Sam Cartwright slid in to score from Ricky Topham’s cross. Northowram are up to sixth after a workmanlike 2-0 win at home to bottom side Copley United. The Rams, playing down the slope, struggled in the opening 45 minutes against committed and organised opponents who did not look like a side seeking their first win of the season. Neither keeper had a save to make in an undistinguished first half that was sprinkled with some meaty challenges. The Rams’ performance improved markedly from the moment Josh Baines, after a neat one-two with Lewis Oldridge, put his side in front five minutes after the restart. Matt Calland, adept at holding the ball up and linking the play, saw much more of the ball and the passing and movement opened up a previously well-marshalled Copley defence. Ash Smee, with a well-struck volley from distance, and Charlie Hirst with a header, came close as the feisty undercurrent simmered. The Rams doubled their lead after 70 minutes when Oldridge combined with Chris Conroy and his low cross was turned in by Calland, who also had an effort cleared off the line. Garry Ash came closest for Copley near the end as the Rams, for whom Archie Griffiths and Matthew Rushworth were a strong central defensive pairing, notched their second successive clean sheet. Illingworth St Mary’s won the other game in the top flight, beating Hebden Royd Red Star 5-0 on the 3G at Trinity Academy. John Booth bagged another three goals and the others came from Joe Griffin and Damien Randall as Saints took a four point lead at the top of the table.. Shelf FC were eye-catching 9-0 home winners over Denholme United in Division One. Kyle Peel showed the way with a hat-trick, closely followed by Callum Lewis and Alex O’Keefe with two each. Gary Boldy and Nathan Charlton got the other goals as Shelf cut Sowerby Bridge’s lead over them to seven points. Holmfield are just ahead of them in second but they dropped another two points in a 2-2 home draw against Ryburn Reserves. Sam Shaw and Craig Eastwood netted for Holmfield and Alex Coburn and Nathan Hargreaves for the fourth-placed visitors. Midgley United Reserves and Calder ‘76 Reserves magically had plenty of players available for their derby meeting. The visitors took the spoils 3-1 with Mike Mckelvey scoring one and making one for the winners. Salem put more breathing space between themselves and the bottom two with a 3-0 win at Crossleys thanks to goals from Chris Talbot, Sean Neary and Louy Kenny. Ivy House avenged their recent defeat at the hands of top of the table rivals Illingworth St Mary’s with a 2-1 success in another hard fought Division Two game. Ivy started the stronger with their more experienced side winning the midfield battle. Against the run of play Illingworth took the lead with a fine header from a corner by leading scorer Bailey Naylor. Ivy battled back and it was no surprise when Jordan Powell levelled from the edge of the area. Illingworth’s Jamie Randall and Kyle Butler looked to be keeping dangerous Ivy strikers Anthony Brown and Jake Kennedy quiet. However, with 10 minutes left the ball fell to Kennedy inside the box and he made no mistake, shooting past keeper Tony Clarke. Both sides should take full credit for a competitive, entertaining game played in good spirits and excellently refereed by Andy Gee. Northowram Reserves made it seven wins on the bounce in Division Two with a 5-1 success away to Hebden Royd Red Star Reserves at Mytholmroyd. They were always on control, building a 3-0 lead by the interval. Chris Dunne capped a fine performance up front with two goals and the others came from Mark Hayward, Dan Rushworth and Sam Gee. St Columba’s scored five goals in each half to beat Sowerby Bridge Reserves 10-0 at Savile Park. Highlights included a hat-trick for Jack Wilkinson while Ben Caldwell scored three penalties. Vinny O’Shea opened the scoring early on, Kutubo Touray picked up two goals and Scott Holmes came off the bench to grab the other. Junction Inn maintained their promotion drive with a 7-2 home win over AFC Crossleys Res, while there were doubles for Liam Calvert and Joe Grimley in Plummet Lion’s 6-3 win away to Salem Reserves. Shelf United Reserves completed an excellent day for the club by inflicting an 8-0 hiding on Sowerby United Reserves.Chris Graham and Paul Jack each scored two goals.